WHERE AND HOW IT WAS FIXED. The members of the longitude party consisting of Mr. G. F. Dodwell, Government Astronomer of South Australia Mr. H. B. Curlewis, Government Astronomer of Western Australia, Mr. C. M. Hambidge, of the South Australian Survey Department and Mr. C. A. Maddern Assistant in the Adelaide Observatory, immediately after the completion of longitude work at Deakin, on the trans-Australian railway journeyed to Perth and thence proceeded up the coast in the State steamer Bambra, to carry out a similar task in the East Kimberley. 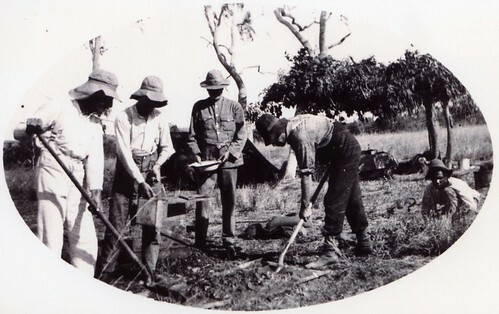 A suitable spot for the camp , was reached on June 20, and the erection of the aerial masts, the building of the cement observing pillars and the setting up of the tents and bush shelter were set in hand at once. As soon as the cement pillars were ready, the two instruments—Mr. Dodwell's portable transit and Mr. Curlewis's 12-inch theodolite, were installed in position and observations for time were commenced. These were continued with-out intermission until July 7, and from the preliminary computing the clock errors thus obtained, appeared quite satisfactory.